Spello may be a tiny town, but it houses some of the very finest art works in this region. Those who come here for the day head straight to the fine church of Santa Maria Maggiore where Spello’s art jewels are to be found. The church was completed in 1285, but its crumbling facade was reconstructed in the 17th century, using the original materials. It stands in a small square paved with medieval cistern covers. The 2 large fluted columns in marble which you can see at the foot of the bell tower are the remains of an earlier, Roman structure; the church was built on an important Roman road that ran through this area. Inside, there is a single, wide nave and seven altars. The light filters through the many windows, highlighting the rich stucco decoration, paintings and sculptures. But it is the Baglioni Chapel that, rightly, commands attention. 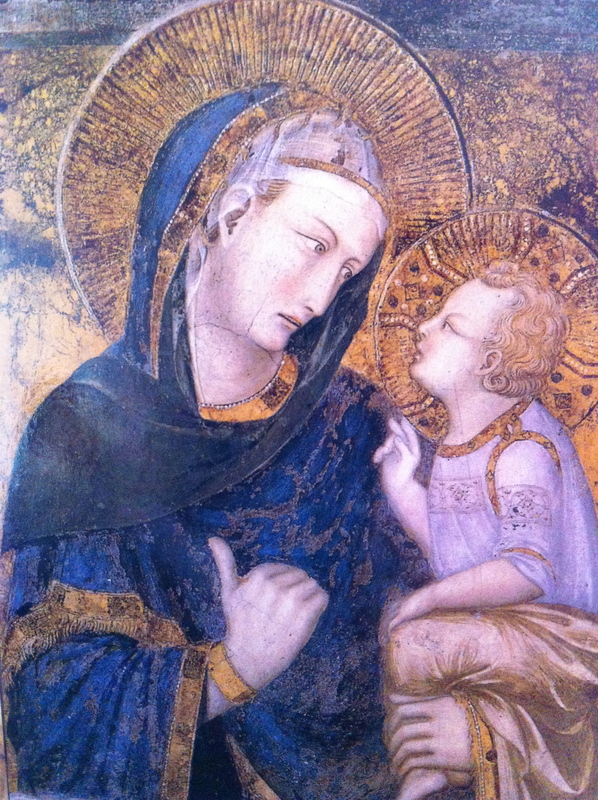 The decoration was commissioned by Troilo Baglioni who was the Prior of Santa Maria Maggiore in the 16th century. The artist was Bernadino de Betto, more commonly known by his nickname Pinturicchio – “little painter”. This nickname referred to his short stature, not to his artistic talent. Pinturrichio joined the Perugia painters guild around 1481, the same year in which he collaborated with the artist Pietro Vannucci, known as Perugino, on some frescoes for the walls of the Vatican’s Sistine Chapel in Rome. Pinturrichio also decorated the (Papal) Borgia apartments and a produced a fresco series for the library of Siena cathedral. 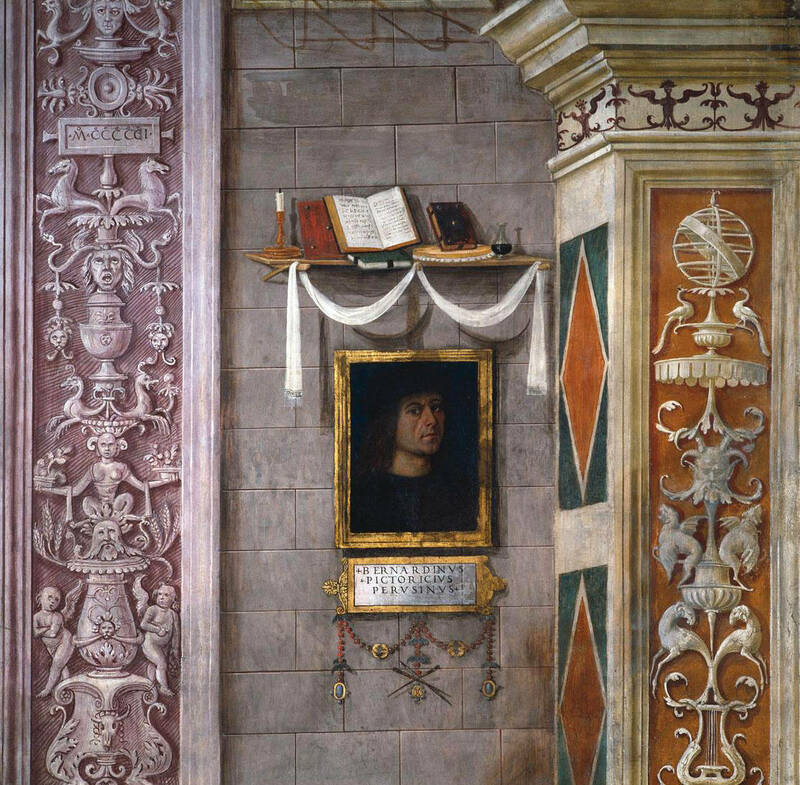 He painted the Baglioni Chapel in 1500 to 1501. His work is highly decorative with superb attention to detail, particularly in his figures. Like other artists of his age, the women are depicted as graceful and serene and the landscapes have depth and an air of peace. 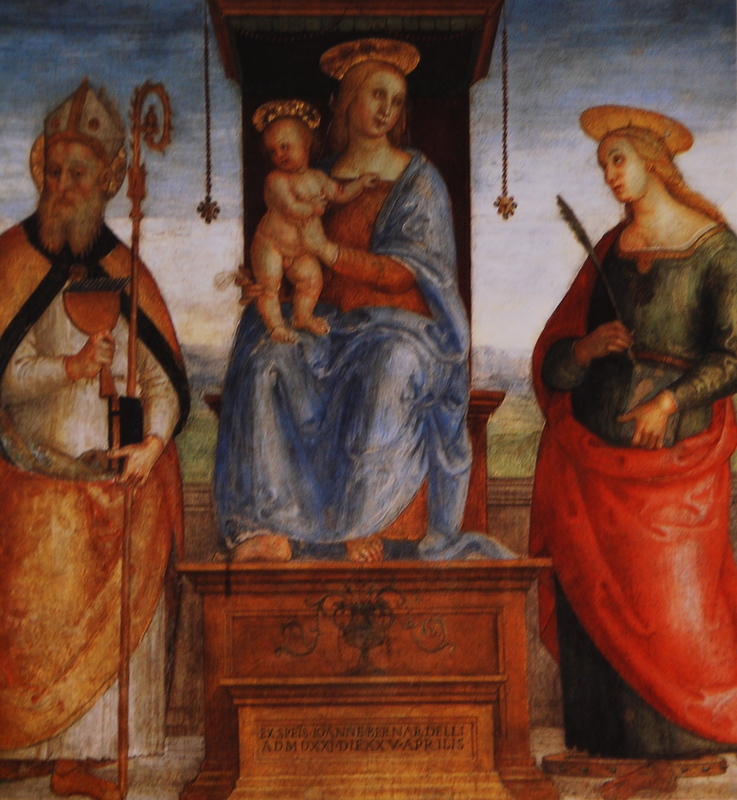 Pinturrichio is said to have influenced other Umbrian artists such as Raphael, who was apprenticed to Perugino. Baglione can be seen at the far left of this picture dressed in his black habit, standing next to his treasurer in a blue robe holding a bag of money. The floor of the Chapel is made of small, glazed majolica tiles dated 1566 from nearby Deruta, showing winged horses, birds and plant motifs. 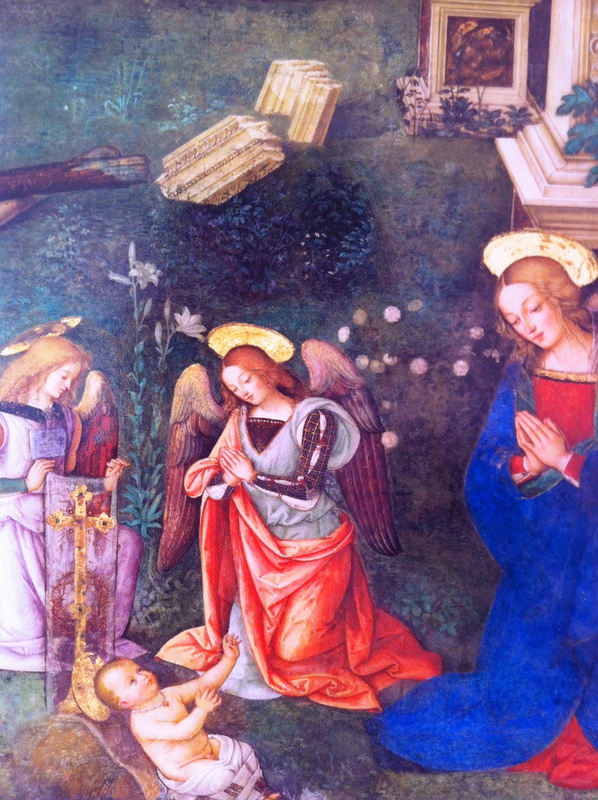 Also represented in the church is Perugino, whose 2 works here date from around 1521. I have mentioned before that we are staying in part of the ex-nunnery of Santa Chiara (Saint Clare). The church houses an oil painting from this house which was formerly a panel used to partition the closed-order nuns from the public. 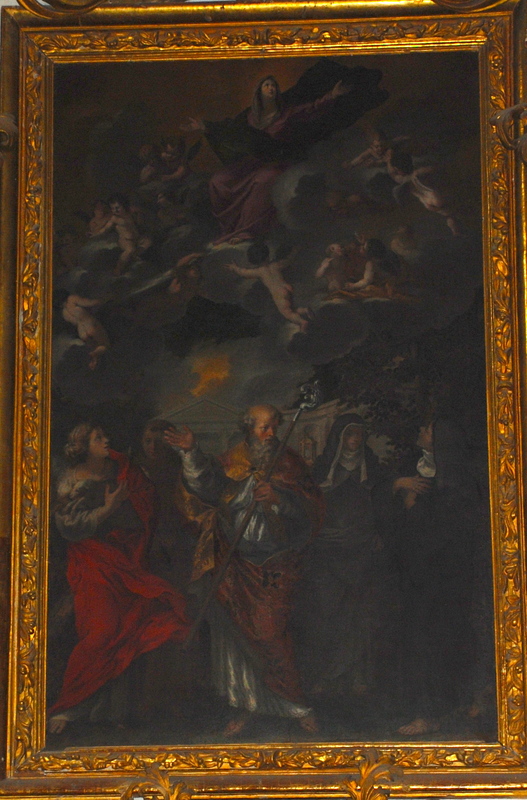 This painting, from around 1700, is attributed to Carlo Lamperelli, who was born in Spello. Unfortunately I have struggled to find a good photograph of this painting which, even in the flesh, is rather dark and unclear. 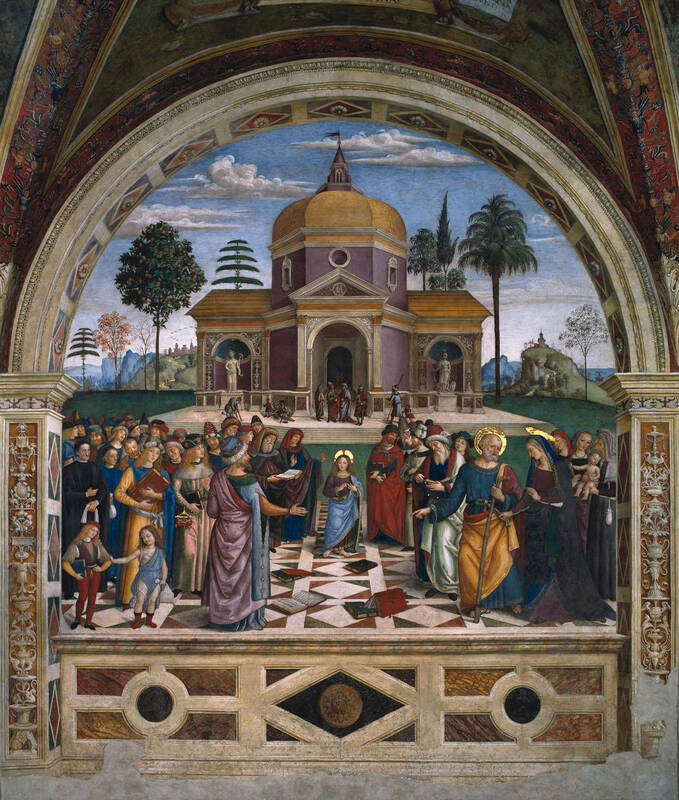 Panel from Santa Chiara by Carlo Lamperelli. Santa Maria Maggiore, Spello. The church of Santa Maria Maggiore is a treasure house. The Baglioni Chapel is a masterpiece. I don’t mind paying my 2 Euros to light up these frescoes as I fully understand the need to protect them from excessive light. However, an opaque glass panel has been constructed across the front of the Chapel, restricting visitors from seeing the frescoes without paying, and since there is not always someone on hand to pay your money to, I saw many visitors leave the church without having had the chance to view these masterpieces. Aside from that, the glass barrier is extremely ugly and it ruins the lines of the church. Remove this monstrosity, powers that be. 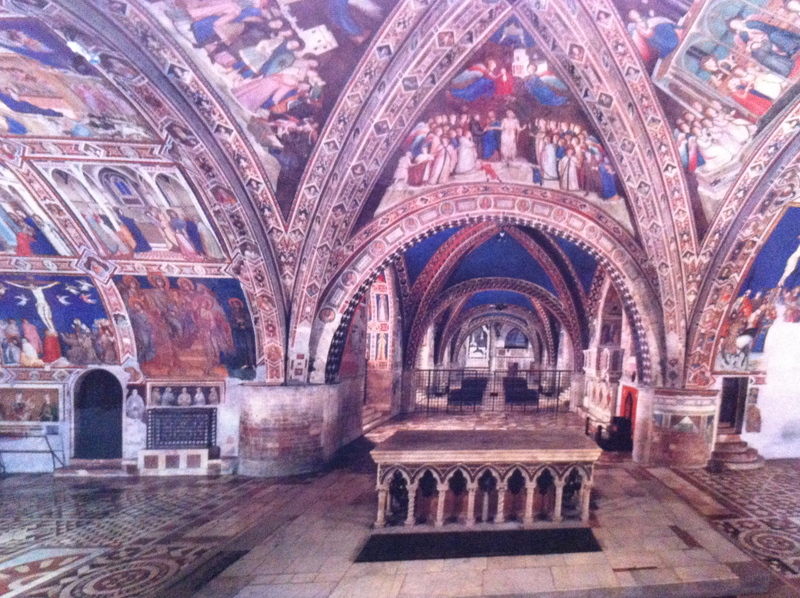 Charge us to light the frescoes like other churches do, with pay and display lighting! 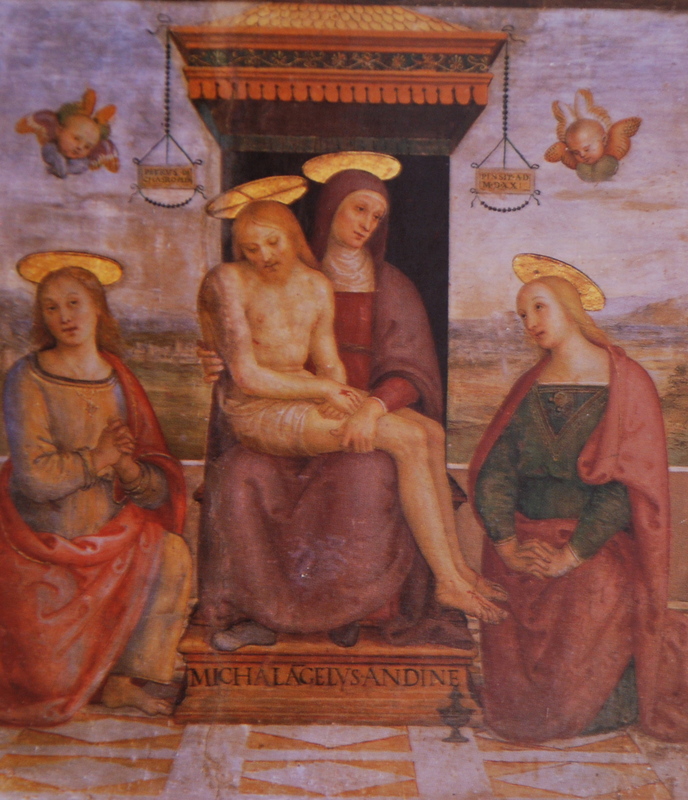 This entry was posted in Umbrian Art and tagged Baglioni Chapel, Basilica di Santa Maria Maggiore, Perugino, Pinturrichhio, Santa Chiara, Santa Maria Maggiore, Sistine Chapel, Spello on April 10, 2013 by maryshoobridge. 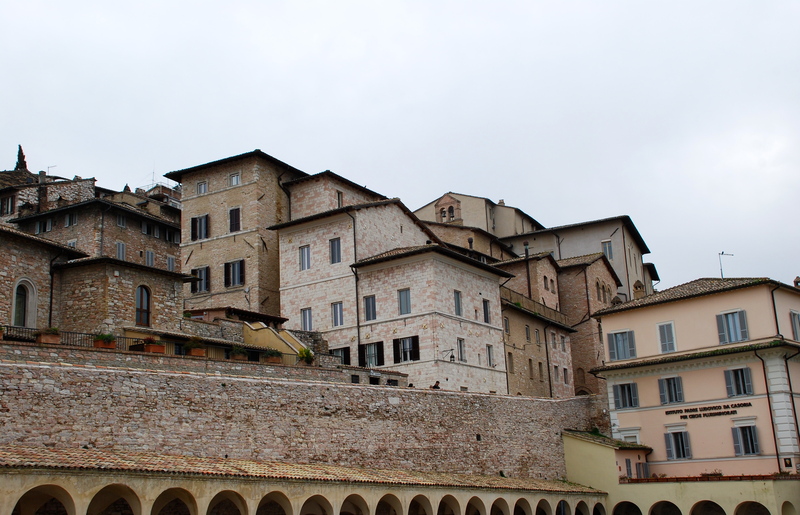 There are several ways to travel from Spello to Assisi. The first, quickest but most boring, is via the main route SS75. Secondly, the local roads that go gently north through some small historic villages. And the road we chose. Right up almost to the summit of the Mountain, some 1290 metres (4230 feet) high. The mountain was (and perhaps still is) regarded as a sacred and mystical place; the beauty and solitude was certainly inspiring. The route follows an ancient cart track, winding steeply upwards with hair-raising hairpin bends (particularly when the driver is situated on the blind side of the car, as was I). The surface degenerated as we ascended, and soon we were driving over a pounded stone track, full of holes and rocks. Luckily we met few other cars (I should have wondered why) so were able to use the width of the road when things got really bad. The track was barely wide enough for 2 vehicles with very few passing places. Fortunately I was able to pull over when a large cattle truck approached from behind; we saw him shortly afterwards disgorging the animals onto the high pastures. We reached the snow line shortly afterwards. 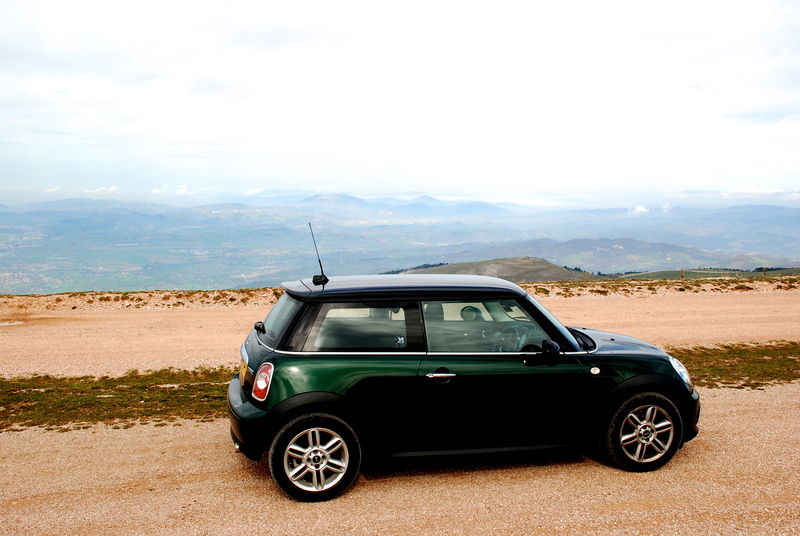 Where do you take your Mini? 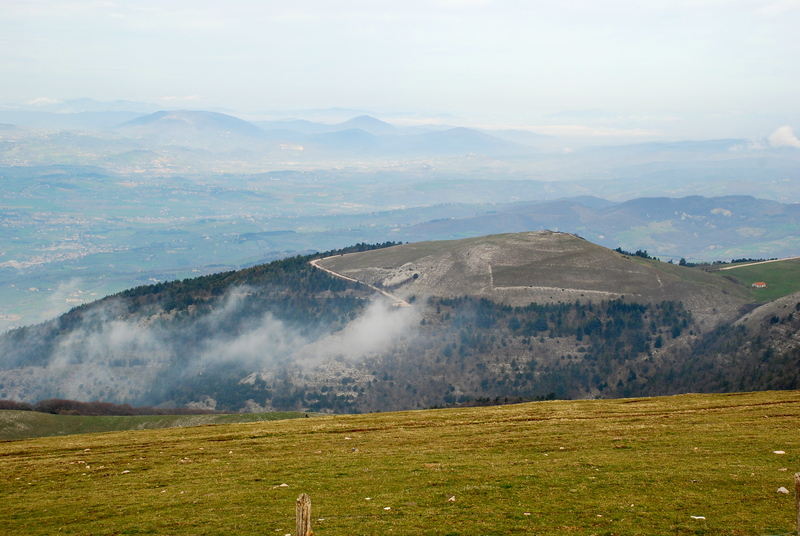 When we did get the chance to stop, we were treated to superb views across to the Appenines. 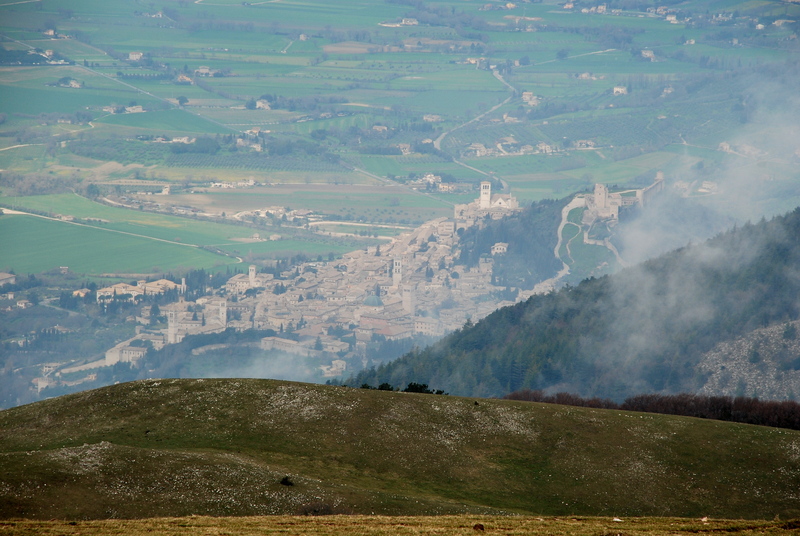 Eventually we got our first view of Assisi, tumbling down the lower slopes of the mountain, the rose hue of its stones shimmering through the swirling cloud. 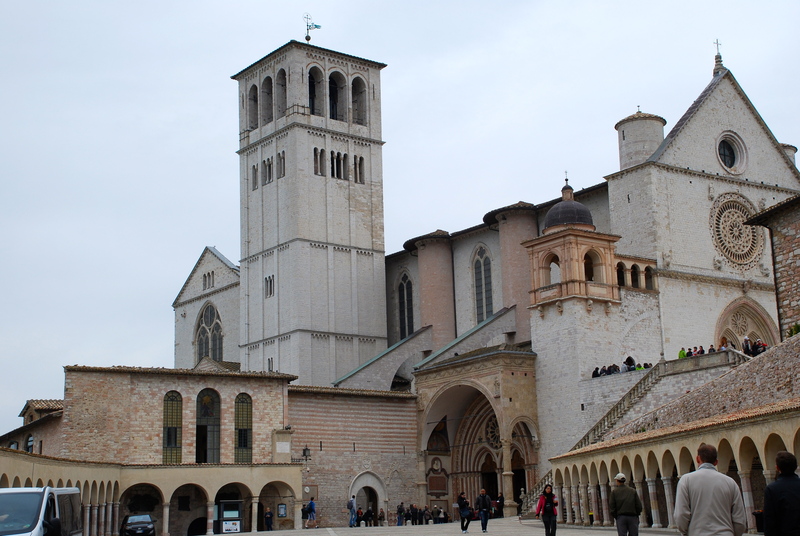 Assisi was the birthplace of Saint Francis, and it was here that he set up his religious order, based on the vows of poverty, chastity and obedience. 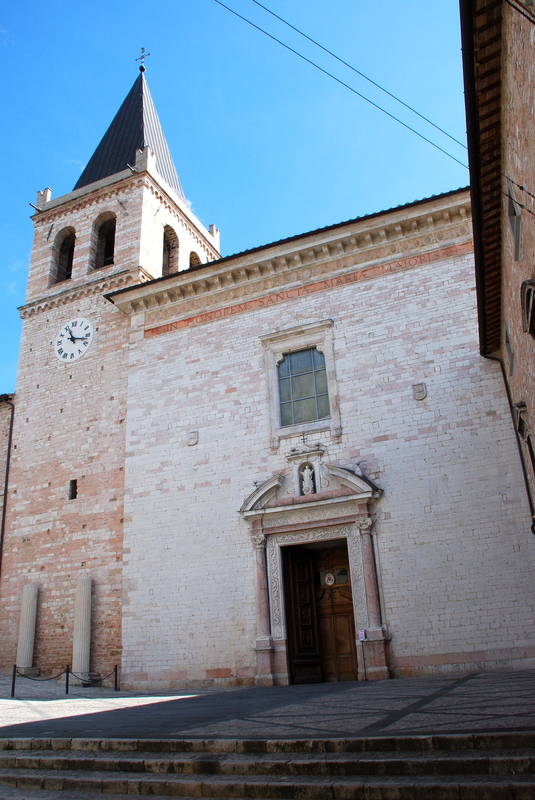 The town is permeated by monuments and art commemorating the life and works of both Saint Francis and Saint Clare, who also lived and worked in Assisi. 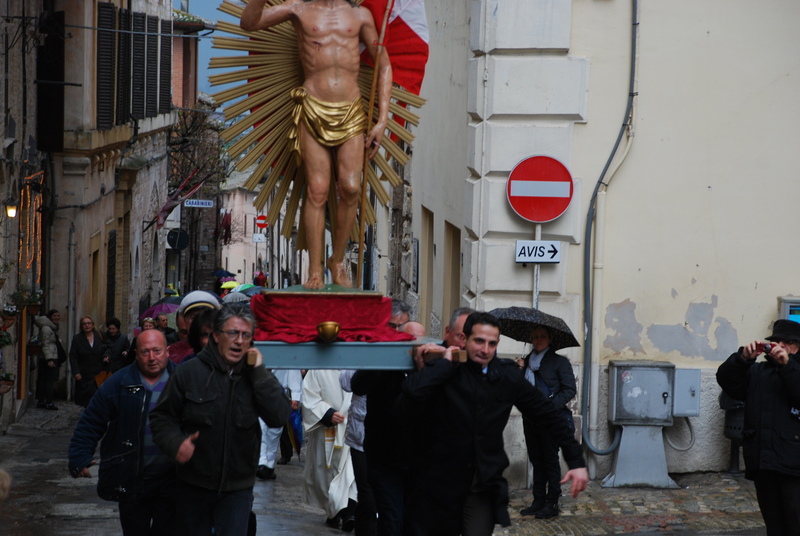 It is for this reason that the town remains a place of pilgrimage for many Christians, and is one of the main tourist centres in Italy. The most significant monument is the Basilica of Saint Francis, constructed shortly after his death in 1226, although much of the internal decoration was added later. The Basilica dominates the town; externally I did not think it was beautiful architecturally, but inside it was visually stunning. The Basilica consists of 2 churches: the upper church was built on top of the lower church and the crypt. All have been damaged to some extent by earthquakes, but the restoration has been well executed. The tomb of Saint Francis is in the crypt, along with those of several of his closest followers. The lower church is rather dark, but the quality of the wonderfully rich art is superb. Some of the greatest artists of the age, including Giotto, Cimabue and the unidentified Maestro di San Francesco contributed to the frescoes. No photography is allowed, so the following photos are taken from postcards, just to illustrate the extent of the decoration. Basilica of St Francis, Assisi. Lower church. The upper church is lofty and bright. Its art is more famous (though I am a fan of the lower church art), in particular the episodes from the life of Saint Francis are considered to be amongst the world’s great masterpieces. This fresco cycle was attributed to Giotto and his assistant, but more latterly is thought to be the work of the Maestro di San Francesco. 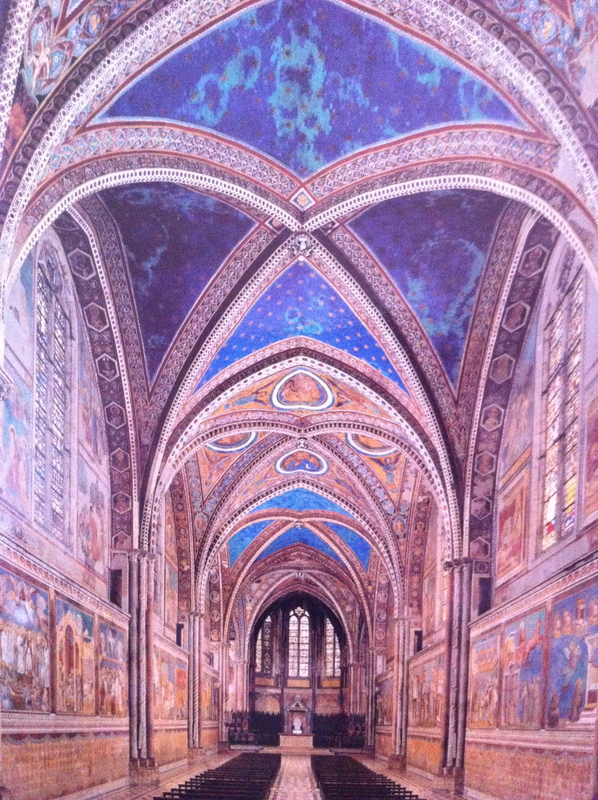 But both Giotto and Cimabue are well represented in the art of the upper church. Basilica of St Francis, Assisi. Upper church. 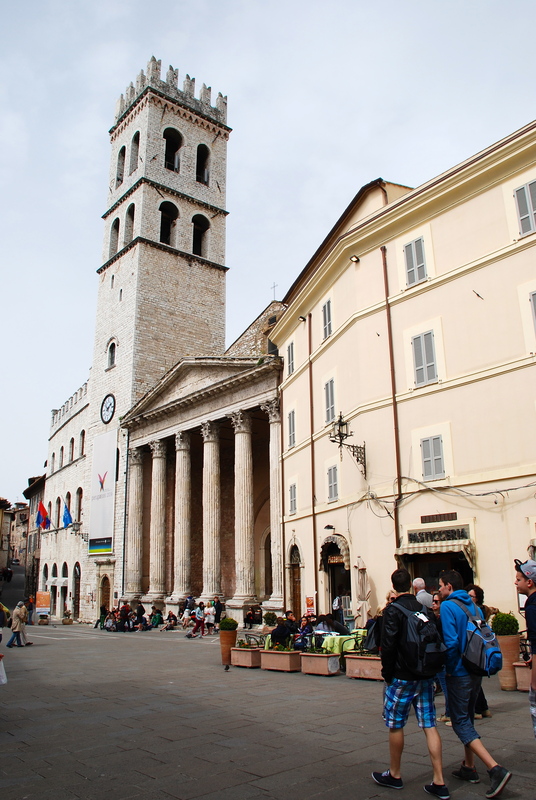 Leaving the Basilica, we walked to the main square – the Piazza del Comune – which is largely medieval and well preserved. In fact, the Temple of Minerva (1st Century BC) and the Torre del Popolo (13th Century) can be seen in one of the frescoes of the life of Saint Francis! 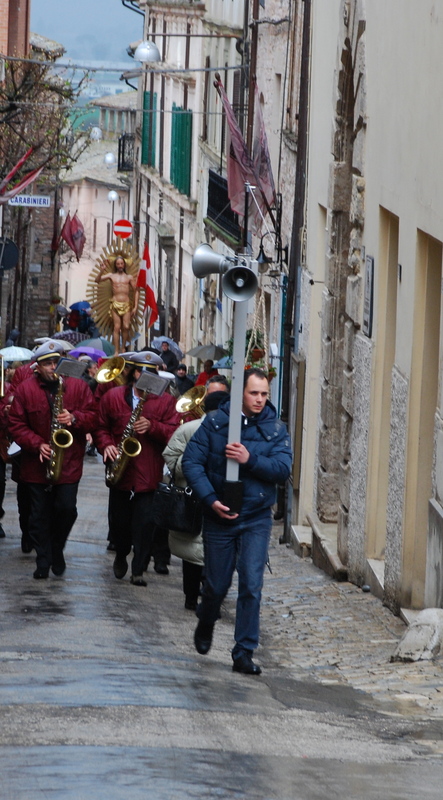 The town was crowded with tourists, surprising this early in the year. It was disappointing that many of the restaurants and shops seemed to cater entirely for the tourists, with fast food and cheap religious souveniers everywhere. I have said before that I am not religious, but I love the architecture and art that organised religion has generated over the decades. I still find it distasteful that making money is such a key feature of many religious sites. We called it a day at that point; it is just too much to take in on a single visit, so we will return to again do battle with the crowds. 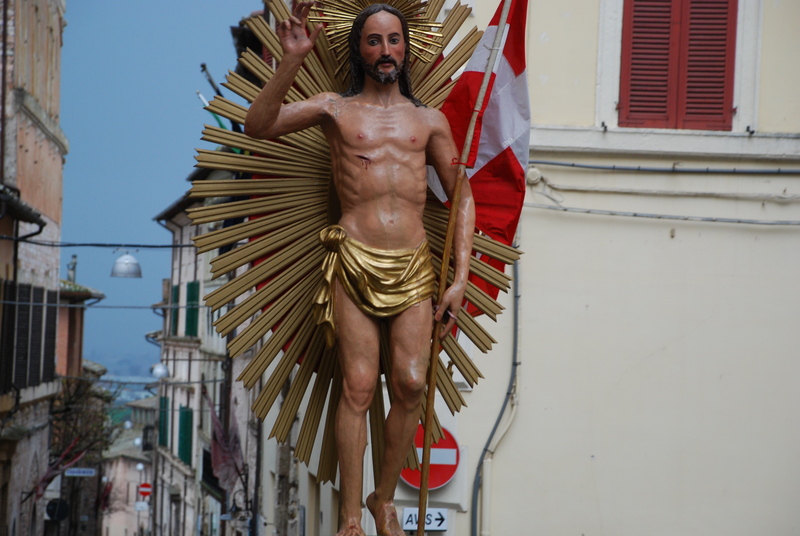 This entry was posted in Italian Life, Umbrian Hill Towns and tagged Assisi, Cimabue, Giotto, Maestro di San Francesco, Mini Adventures, Monte Subasio, Saint Francis of Assisi, Spello on April 5, 2013 by maryshoobridge. 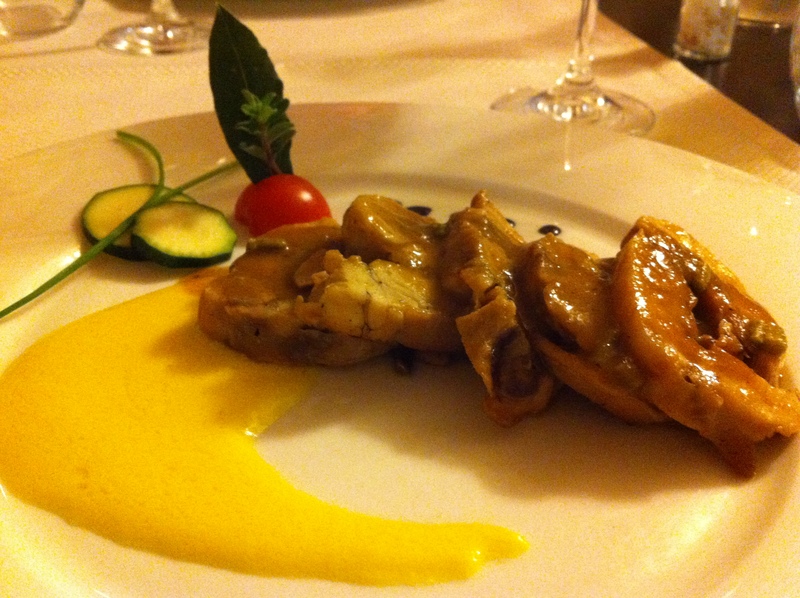 The cuisine of Umbria uses regional and seasonal ingredients to produce its simple, traditional dishes. 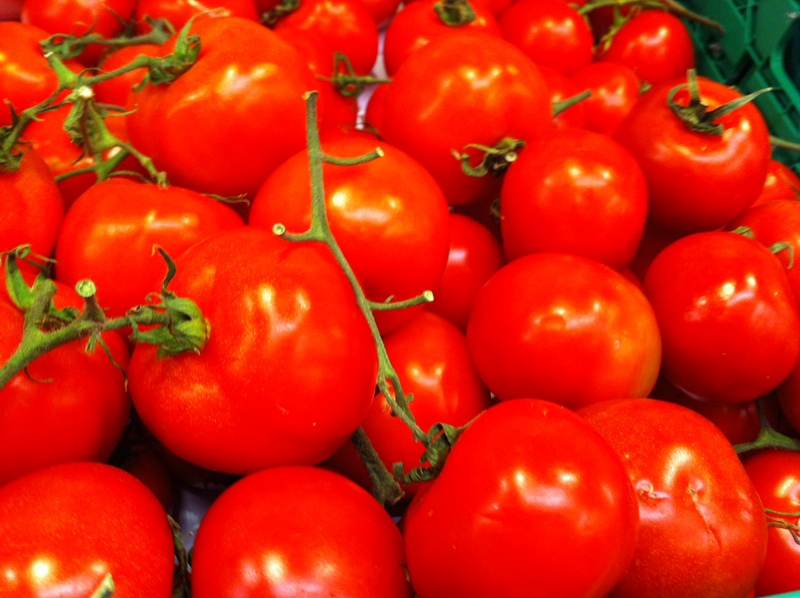 Its rich soil, extensive farms, lakes and woodlands provide a plentiful larder of splendid ingredients for its tasty, robust dishes. 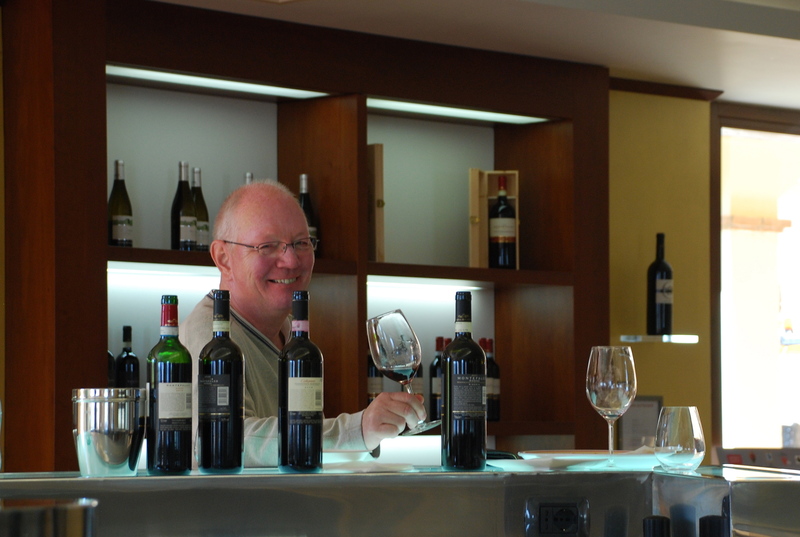 I have been pleasantly surprised by the excellent quality of the food and wine of the region, although I am sure I have a lot to learn over the next few months. 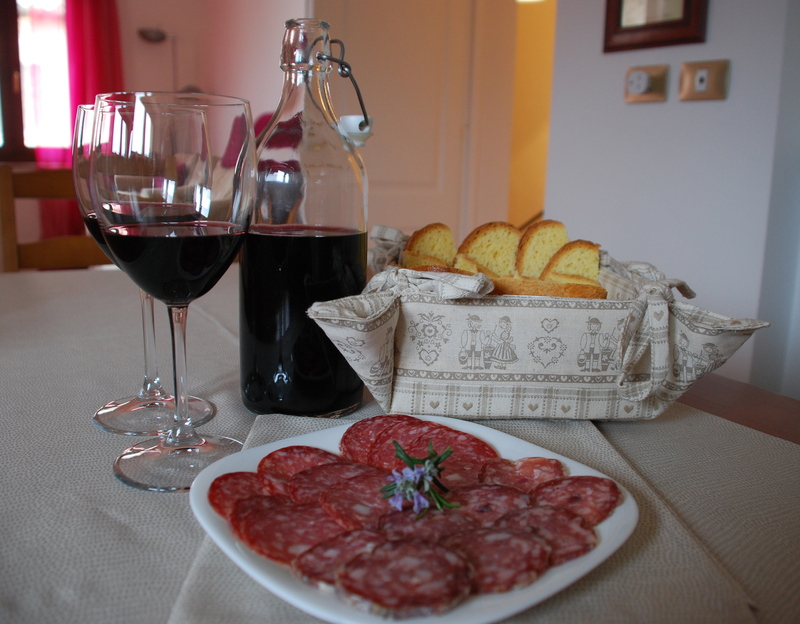 Cured meats or salami are a speciality, with wild boar, pig and donkey being popular. 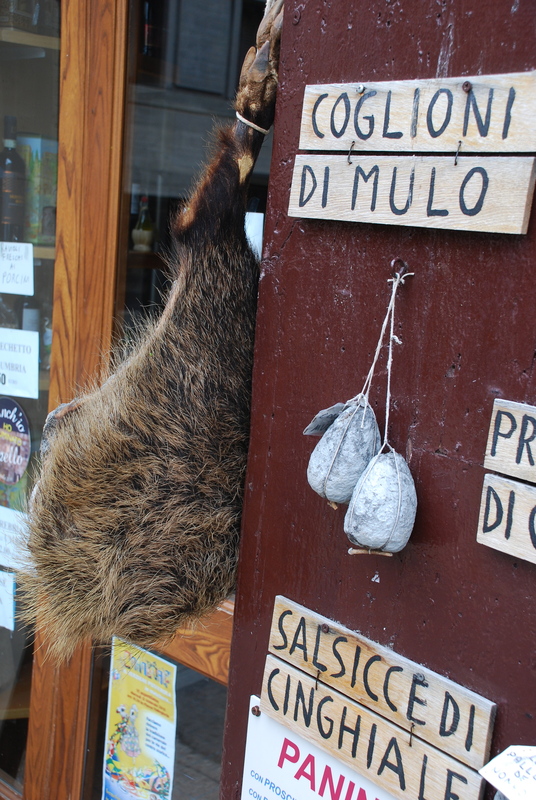 But are the Palle de Nonno (Grandfather’s Balls) made from authentic ingredients? 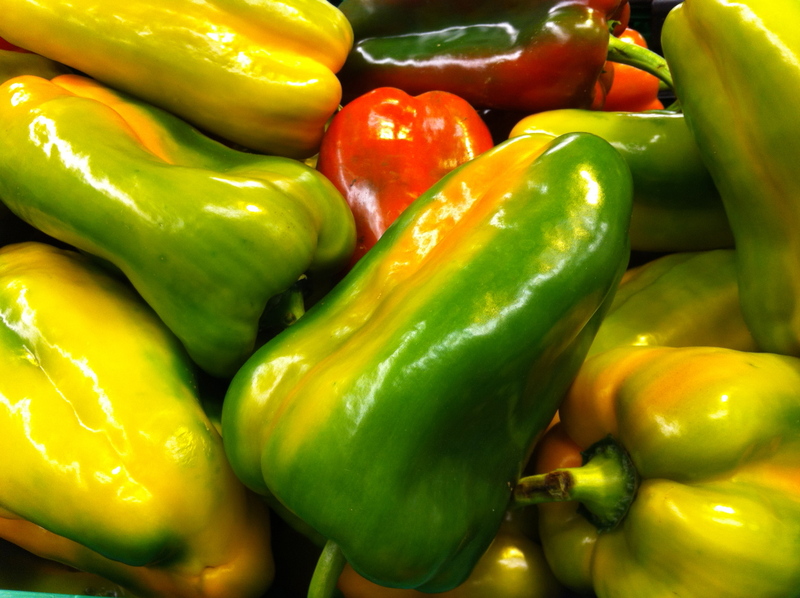 Vegetables too are in plentiful supply, fresh, huge and delicious. 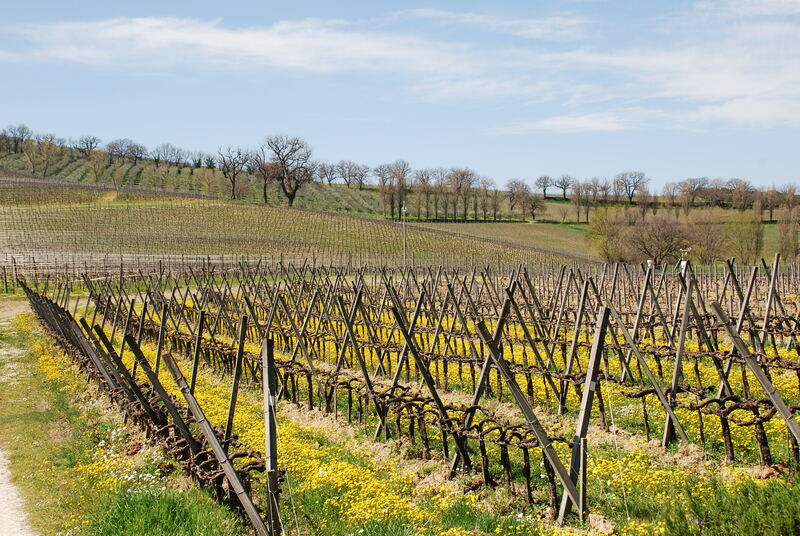 Umbria also produces high quality red and white wines which are respected throughout Italy. 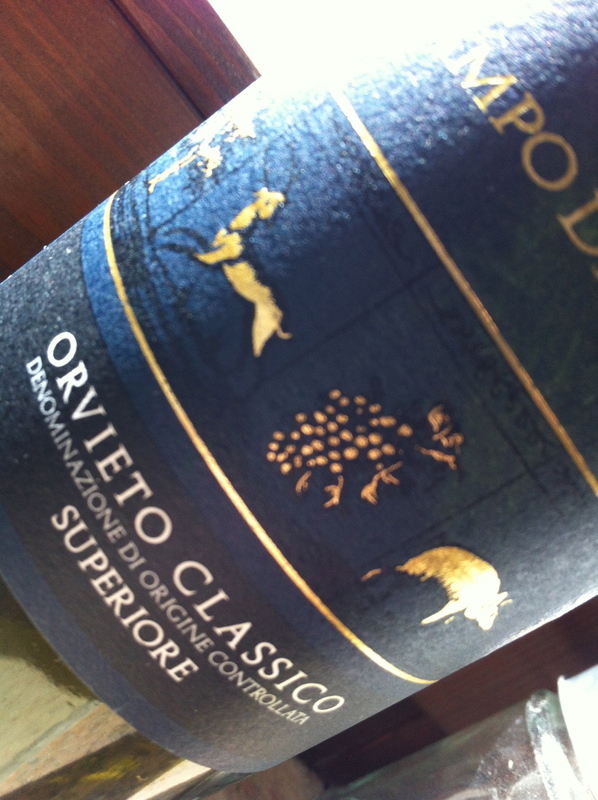 It has not been possible in a week to sample a huge selection, but we have sampled a fine white wine – Orvieto Classico Superiore – made from grechetto grapes from the Orvieto region. At just over 4 Euros a bottle, that was good value. 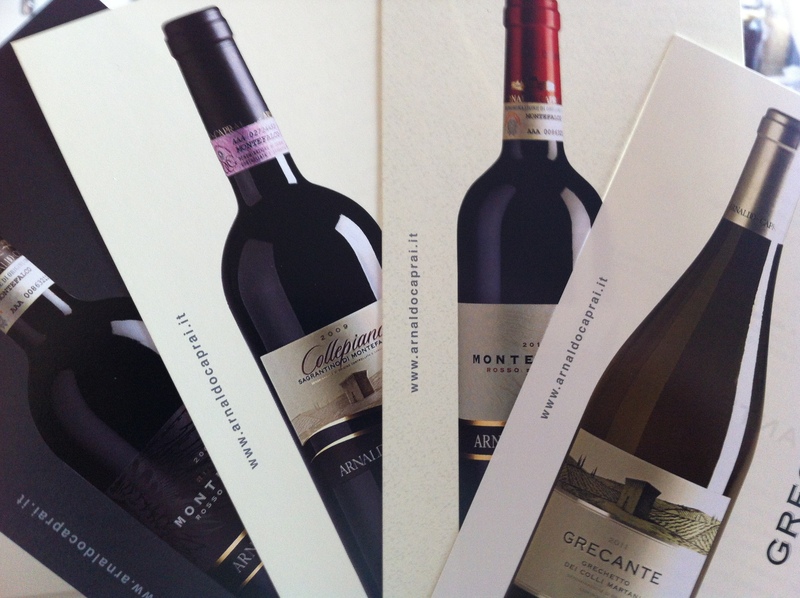 The top red sampled so far is Sagrantino di Montefalco. 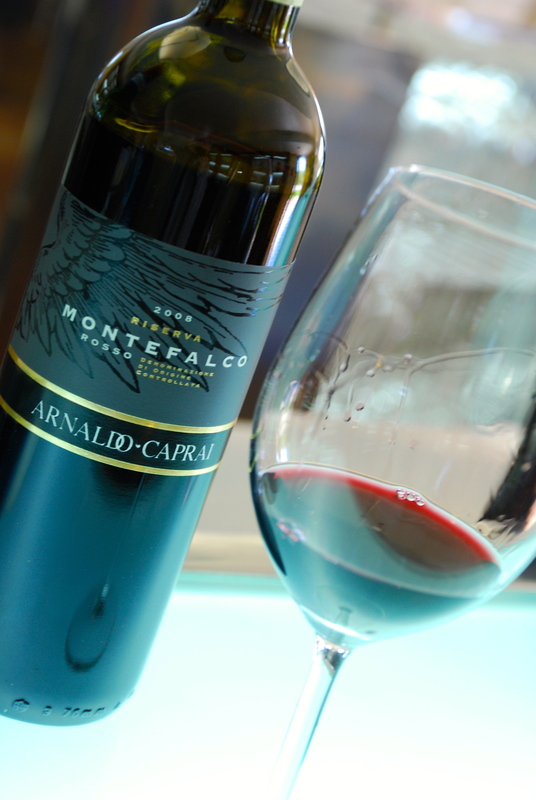 The native sagrantino grape has been recently revived; Sagrantino di Montefalco, which contains only that grape, is fast becoming Umbria’s flagship wine. 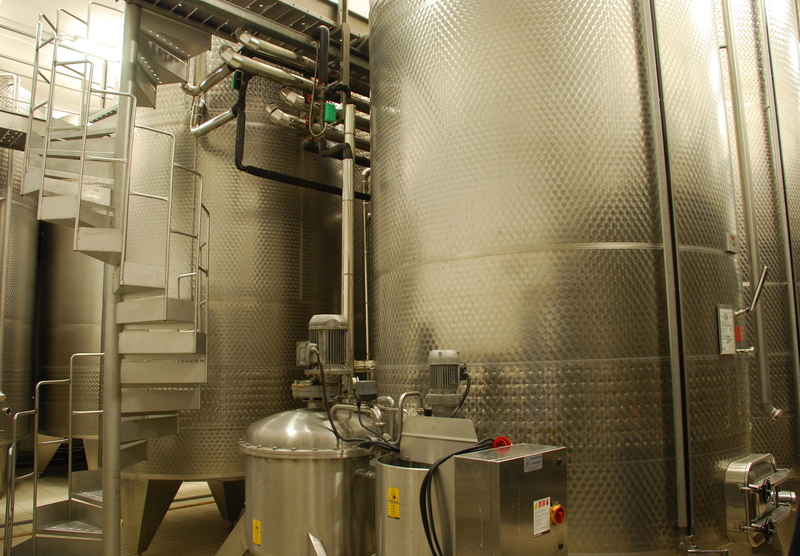 It has a distinctive flavour, powerful and complex. 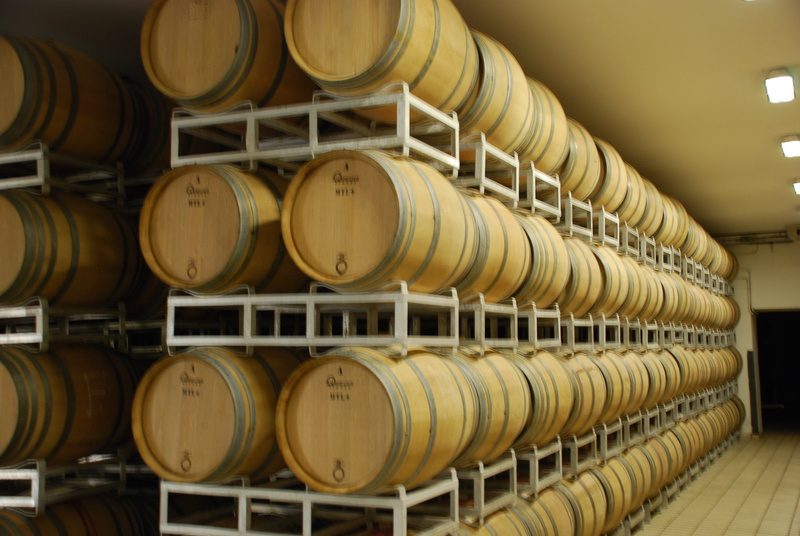 A bottle of the very best from the famed vintner Arnold Caprai is on the shelf, waiting for that very special occassion. 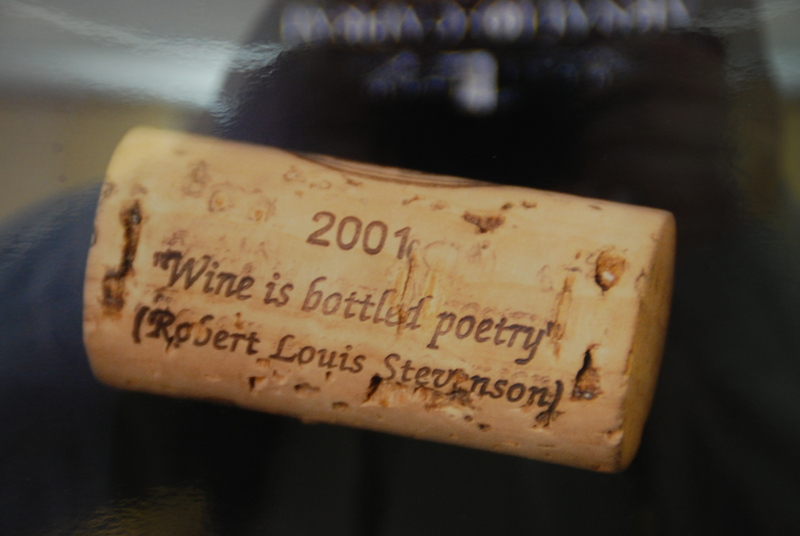 The bottle picture above was savoured with an excellent lunch at the Ristorante Porta Venere, tucked away in a medieval cellar. We ate fresh bread with local olive oil, followed by rabbit stuffed with wild asparagus and proscuitto. Ristorante Porta Venere: Rabbit stuffed with wild asparagus and proscuitto. 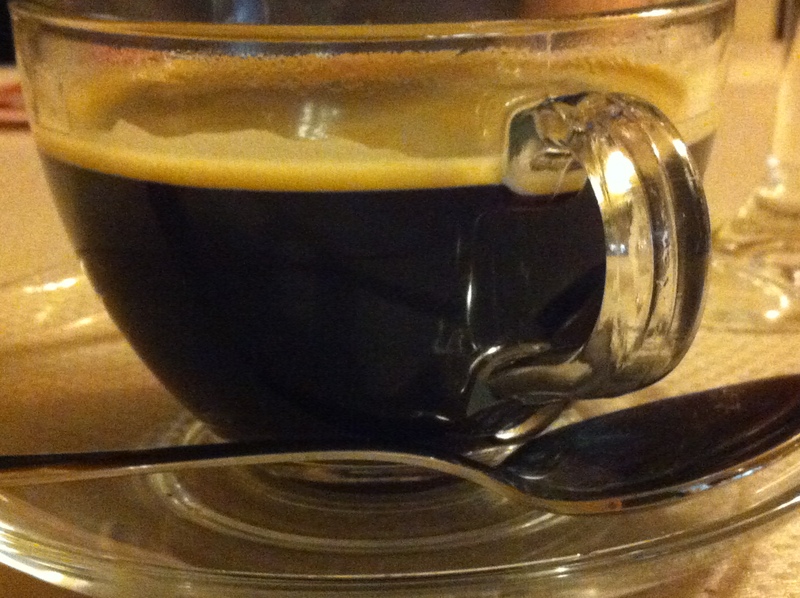 A few days earlier we had had a completely different – but equally good – dining experience at the Osteria de Dada. A tiny place, stuffed with rowdy locals, no menu or wine list, one chef and one waitress! It could have been a recipe for disaster, but the house wine was great, the roast lamb and pork loin were exquisite, and the singing chef and waitress made for a thoroughly entertaining meal. 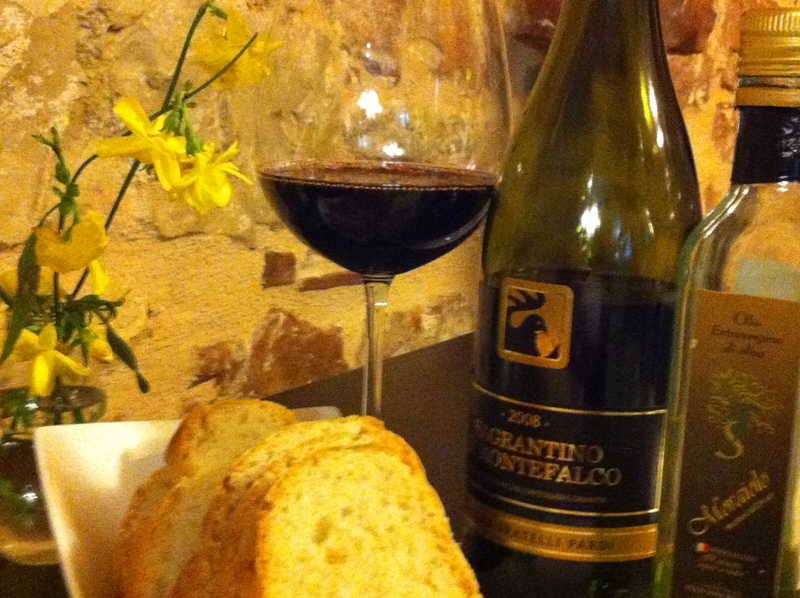 This entry was posted in Umbrian Food and Drink and tagged Italy, Orvieto, Sagrantino di Montefalco, Umbria, Umbrian Cuisine, Wine on April 3, 2013 by maryshoobridge.